The Reader’s Digest used to publish a feature every month called Life in These United States. Until turning this morning to the Google machine, I didn’t know if there still was a Reader’s Digest. I guess there is. Maybe it still features stories about Life in These United States. I don’t know. But I did see one of those type of moments this morning while driving to West Liberty. Well, it may have been more of a life in Iowa moment, but it seemed like a story worth telling. A farmer was eastbound on U.S. Highway 6 on an old John Deere 4020. I couldn’t get a picture because I was driving westbound in my old Bronco. Anyway, a fairly long line of cars was developing behind this farmer as he drove along in what my dad always called “road gear” … top speed of maybe 20 mph. But the farmer — who was talking on his cell phone as he rumbled along — seemed oblivious to the lineup behind him. I couldn’t help but wonder if he was using a new iPhone 5. 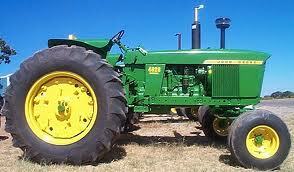 If he was, it would be sort of appropriate because the 4020 was perhaps the most-popular tractor of its era. Nearly 185,000 of them were made from 1963 to 1972. And many of them were made at the John Deere plant in Waterloo, Iowa. It seemed as if nearly every farmer had a 4020 when I was a kid growing up in south-central Iowa. You still see a lot of them in use today. No one will ever write such a paragraph about the iPhone 5. As cool as it may be, it seems unlikely many will still be in use 40 to 50 years from now. My dad bought a JD 4020 too; he died 2 years ago at age 87, and my brother is still using the 4020 today! Thanks for the comment, Janet. I grew up in an Allis-Chalmers family, but I’ve driven many 4020s. They were great tractors.